At the age of seven, Despina welcomed her sister Kat into the world. “I was always her protector growing up,” says Despina. “She was like my little doll.” During Kat’s teenage years, Despina styled Kat’s hair, let Kat borrow her clothes, and guided her with relationships. “We had a beautiful, rich childhood, surrounded by family, and filled with love and protection in the Greek community.” After the sisters both married, they visited often and traveled together. So many thoughts ran through my head. 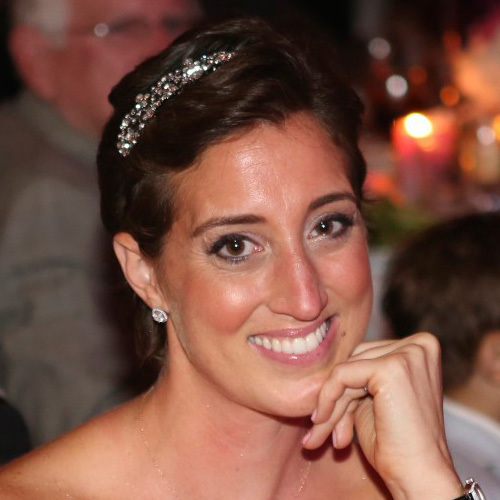 How and why did my 32-year-old baby sister get breast cancer? Will she be okay? Will she ever have any more children? It seemed like a nightmare. Everyone gathered at Kat’s house at noon that day. We cried together, promised each other this would be a small bump in the road for Kat, and determined we would do everything in our power to help her find the best doctors and treatment and to hold her hand and be by her side every step of the way. Naturally, our parents were heartbroken. Each of them dealt with the news in their own way. Dad didn’t talk about it much as it was too hard for him to bear. And our mom turned to the church and her faith. I was in a dark, sad place for a few months watching little sister undergo a double mastectomy. I was angry and sad and questioned ⎯ why her and not me ⎯ over and over again in my mind. When Kat started chemo, her hair began falling out after the second treatment. I washed and combed it for her until it was time to shave it all off. The fear of losing ones hair as a woman is worse than the actual act of getting it shaved off. We laughed and cried a lot that day. She was on the road to recovery. One afternoon, while sitting in Kat’s surgeons office, George (Kat’s husband) and I were discussing how fortunate Kat was to be able to access the best care in NYC. She has great insurance, an amazing support system and a group of doctors who were top in their fields. We were shocked to discover that women are dying, here in the United States, because they don’t have insurance and can’t pay for cancer surgery and treatment. “We take something bad and make good from it by helping women with limited resources and bringing awareness to breast cancer and the challenges many women face,” Despina says. This is how Kat’s Ribbon of Hope, which held its first meeting at Despina’s house in April of 2013 with 40 people in attendance, came to be. Seven months later, the first event gathered 120 golfers for an outing and 400 dinner attendees to honor Kat and her team of Doctors. Explore the Kat’s Ribbon of Hope website to learn more about why making critical information and services more accessible to women in their fight against breast cancer is so important. Discover how nonprofit, charitable organizations that fund breast cancer research, awareness, early detection and treatment represent a new paradigm. 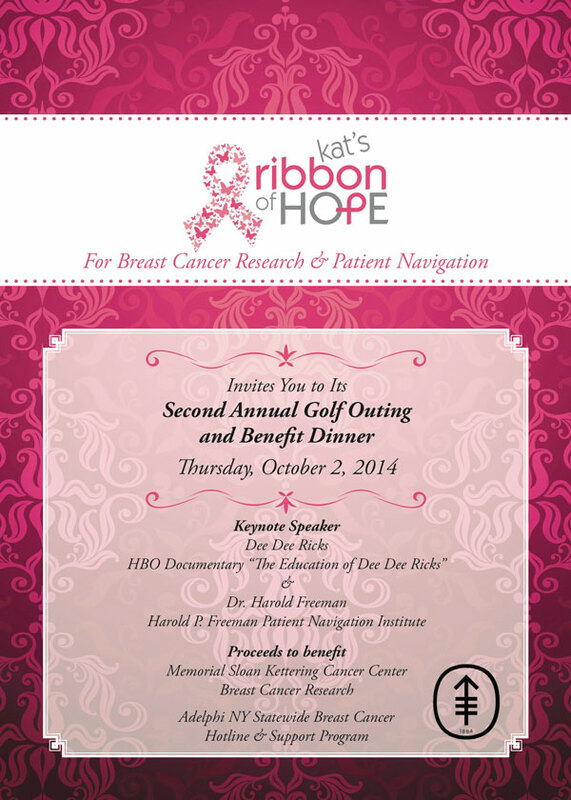 The efforts of Kat’s Ribbon of Hope not only transform an elusive, abstract concept like health disparity into a real, measurable social and biological challenge, but provide practical opportunities for people to contribute their time, talents, and resources to underserved minority women diagnosed with breast cancer in Nassau County. One such opportunity is an upcoming event, the Second Annual Golf Outing and Benefit Dinner on Thursday, October 2, 2014. The keynote speakers are Dee Dee Ricks from the HBO documentary, “The Education of Dee Dee Ricks” and Dr. Harold Freeman from the Harold P. Freeman Patient Navigation Institute. A portion of the proceeds from the event will benefit Memorial Sloan Kettering Cancer Institute Breast Cancer Research, and the remainder of the proceeds will support the Adelphi New York Statewide Breast Cancer Hotline & Support Program, specifically, to continue to pay the full time salary of their Patient Navigator, Lois Gets, a bilingual social worker who locates and “takes the hands” of people who need help finding their way around barriers to reliable breast cancer information and proper treatment. Such barriers include language, insurance, and financial hardship, as well as post-treatment struggles, such as employment.